Professor Ibbetson began with the point that precedent has not always been a part of English law and has been more a part of Continental law than we think. He explained that historically, in general, common law precedent focused on law as it was applied in court whereas civil law precedent focused on the principles and rules in the codes. He began with England because here we’re on fairly familiar and firm ground. Before the nineteenth century there was no strict rule of bindingness and no structure by which courts were only bound by courts above them. This is not surprising because it was only in the nineteenth century that we began to get enough regular, reliable reports and a clear hierarchy of courts to think of precedents binding on lower courts. It was only in the seventeenth century that changes in the direction of the modern ways of thinking began to occur. And it wouldn’t surprise anybody, especially after hearing Professor Baker’s lecture, that a central figure in this process was Sir Edmund Coke. We need to address three closely related, but separate phenomena. The first was the practice of following previous cases. Although this was not new and it probably goes back as far as we think there was a common law system, it became more intense with high quality reports. It’s probably hard for us to think of the common law without this since we expect judges to act consistently and English law had nothing like the books and rules of Roman law. The second phenomenon was the development of the idea of authority. Professor Ibbetson paused a minute here before saying something more about it. Naturally King had authority, sheriff had authority in his county, the bailiff in his bailiwick and so on. From the late 15th century we begin to see that some texts were considered to have authority, which must mean that they contained rules that had to be followed, just as the instructions of King, sheriff or bailiff. As the sixteenth century progressed we find it more normal to say that these texts were authority and being authority was something different from having authority. The only books that were authority, of course, were law books. And increasingly there was a strong focus on decided cases that had been authorities. I suspect that the development of the idea of authority at that time was related to the differences between Plowden and Dyer’s methods and those of the Year Books although Professor Ibettson did not say so. And thirdly there was precedent. Many lawyers had been familiar with precedent having prepared formal documents such as precedents of pleading. In the early seventeenth century we find special status being given to judicial precedent, that is decided cases and, in particular, decided cases where the reasons had been recorded. Just as we would say today that judicial rulings and decided cases as precedents were authorities. This judicial authority developed from the theory of argument by dialectic, which would have been familiar to anyone from a medieval university. At this time nearly any text could be authoritative. But there were two categories of authority: necessary and probable. The best example of a necessary authority was the Bible which was true by definition and any conclusion drawn from it was equally true as long as the argument was validly drawn from premise to conclusion. Probable authorities were things that were not true in themselves, but might be true. It was not what learned men said that constituted probable authority, but things like moralizing fables, popular sayings, and customary ways of doing things. This is the world of the medieval university on the continent and in England. In the early 16th century, perhaps first in Holland, a specifically legal dialectic began to appear about how to frame a forensic argument. The argument from authority is the strongest in law (argumentum ab auctoritate est fortissimum in lege), wrote one commentator. The authorities that formed the basis of the argument might be necessary or probable. In the medieval university, the theory of authority was based on a tradition that went back to Cicero. But dialectic and rhetoric were not miles apart. There was another classical tradition. This one was traced not back to Cicero, but to Quintillian. And here we find the Latin term, “praejudicia,” which we can translate as precedents. We’re not sure what Quintillian meant by this term, but it might have meant things that had been adjudged before, the literal translation of praeiudicia. In the early sixteenth century it was said that auctoritas and praeiudicia were interchangeable terms. We don’t know which of these ideas of legal dialectic were used in England, but we do know that some were. Moreover as more common lawyers spent time at university, they would have come across Cicero and Quintillian and would be utterly familiar with the basics of dialectic and rhetoric. We are sure that Coke was familiar with these precise terms when he was at university. Coke used these two sources explicitly in his writing. Indeed he peppered his writings with quotations and near quotations on authority and precedent. Coke was quite clear that these judicial precedents were only probable authority. Although judicial precedent was only probable, it was authoritative in court. All other things being equal, they should be followed. But other things were not always equal. So from about 1700, England had a doctrine of precedent that was rooted in dialectical theory. Notice that this process began about a hundred years before the period covered by Professor Baker and stretched to about fifty years later. How different were things on the continent? At first glance they weren’t very different in theory, but they differed in operation. The writers on legal dialectic in Holland, Germany or elsewhere in Europe were thinking in terms of their own systems, not at all in terms of the unruly English common law. So the argument from authority would have been utterly familiar. To continental lawyers some authorities were necessary, in particular the writings of the Roman jurists. It was laid down in Justinian’s code that they had the force of legislation. The medieval jurists were not regarded as necessary authorities, but as probable ones and the same applied to all the modern writers. The best way to influence a judge was to follow a long line of legal opinion. But the dominant line of legal opinion might be held to be wrong, especially by an appellate court. Previous cases were a problem. Another Roman law text seemed to exclude their significance saying that judgments should be made on the basis of a lex rather than an exemplum. But previous decisions could be distinguished. What really mattered with previous decisions was that they came from a particular court that was known for its learning or issued its decisions under the name of the monarch or ruler. It is tempting to conclude that the mass of citations from Roman law was little more than froth. What really mattered was the jurisprudence of this court. But we should resist that temptation. We should say that the previous case showed the issue behind the mass of citation. These were all probable authorities according to the writers on dialectic. And the previous case merely showed what the correct path through all these authorities was. Courts might look at previous decisions, but their decisions were made according to the true law. Earlier decisions might help them to understand what law lay behind a complex plethora of authorities cited in a present case. In England we can say that it was the printing of large numbers of reports that was really central in allowing the increase in the use of precedent in the early seventeenth century. So do we get case reports in early modern Europe? We certainly do and lots and lots and lots of them. In Italy by 1600 there were thirty-two separate volumes of reports printed in very large folio volumes. There was a real difference between these volumes and those in England. The English reports included the arguments given in court sometimes together with the decision that had been reached, which allowed the successful arguments to be identified so that later readers could identify the reason for the decision and understand what the case was an authority for. The continental model was different. The reason for the decision was constructed by the person producing the volume. In so far as they could be said to be authority, it was probable authority like all the other forms of legal writing that were being produced. Although it’s anachronistic to make the comparison, the continental reports had the same authority as the textbooks used to elucidate the law whereas the English reports had far greater authority. The legal systems of Europe of this time were similar and they were held together by the common Roman law. Professor Ibbetson said that he didn’t think that it was an exaggeration to say that there was so vast an amount of legal literature on the continent in the sixteenth century that one could probably prove an argument and its opposite from it. There was a crying need for something like the English doctrine of precedent to cut through all this mass. A couple of Spaniards even suggested that all foreign law books should be burned. And we do find something similar to the English doctrine, but, in one crucial respect, not identical to it. We can begin tracing this in Naples in the 1490s; one of their statutes said that decisions of the Sacrum Concilium, the highest court, were given in the name of the prince. Thus it was said that it was if the Sacrum Consilium’s judgements had been given by the prince himself, i.e. that they had legislative force. This appeared in one of the most important collections of decisions. But it did not apply to the most important court of the Roman Catholic Church, the Roman Rota, a court whose reasoning was worthy of enormous respect. But its decisions were not given in the name of the pope so they didn’t count as legislation. However, as the sixteenth century progressed all across Europe, decisions of courts were said to have the force of legislation. One of the best discussions of this issue comes from early seventeenth century Portugal. The core rule there was something like that of Naples: decisions of the Senate given in the presence of the King were treated as having legislative force since the king was presumed to have approved them. But the king was not always present. So further arguments were needed to bolster up the authority of court decisions. One very important rule, backed up by a Roman law text, said that a rule of custom might displace a rule of Roman law itself since all law ultimately came from the people. How could you identify such customs? Decisions of the local court would suffice to do so provided of course that they had come from a court whose decisions were worthy of respect, effectively from a superior court. Decisions of the Senate were always more or less acceptable. European legal systems based on Roman law contained a great deal of probable authority, from many thousands of volumes, some of which were very thick. But when we see citations to previous cases, they are overwhelmingly drowned out by the noise of commentators. England had hardly any textbooks, but by the seventeenth century judicial precedents contained almost exclusively probable authority in what was a very small number of reports. The continental doctrine of precedent, on the other hand, had come about differently. For there the relevant case law in the judgment was necessary authority, which meant that it created absolutely firm binding rules. The great advantage in the seventeenth century and today in the English doctrine was that it created a great deal of provisional bindingness. But it was only the decisions of the House of Lords that produced any binding rules and they were relatively few in number. On the continent Supreme Court decisions have stronger authority, but they lack the flexibility of the English doctrine. Their very rigidity prevented them from developing into something like the English doctrine. The continental doctrine lacked the ability to work over a very long time. Professor Ibbetson followed with a gracious thank you and we with thundering applause. After Professor Reynolds presentation, Diversities among Common Law Nations, Emeritus Professor Sir John Baker and Professor David Ibbetson spoke on the historical development of modern precedent and case reporting. Although the two differ superficially, they are in fact deeply intertwined. It may be said that they both spring from the same origin: changes in the theory of authority in the sixteenth and seventeenth centuries. Professor Baker began with the origins of case reporting in England, as we know it, between 1550 and 1650. The story begins at the end of the series of Year Books in 1535. When Edmund Plowden entered the Middle Temple in 1538, he began compiling reports of cases and continued this practice throughout his career. These reports were published as Plowden’s Commentaries in 1571. They were the first of the nominate reporters and differed in important respects from the Year Books. Although the Year Books had been anonymous, Plowden published his Commentaries under his own name. He had found out that someone had quickly and carelessly copied his notes and intended to publish them. He was forced to publish them under his name to secure the credit for his assiduous work. Indeed Plowden felt it necessary to apologize for putting out his reports in his own name. A more substantive departure from the Year Books is his decision to include only considered decisions (decisions of particular importance that set precedent) in his reports. Although he copied the Latin so that readers could see the pleadings, he translated them into law French because of the wide-spread doubt that the common law could be expressed satisfactorily in English. But his greatest departure was recording cases after judgment because this is what the profession wanted. The Year Books had recorded cases before trial, which is why they had not included many things that we now take for granted. This is why the Year Books seem so inconclusive. To the compilers of the Year Books, the judgment was considered legally uninteresting in comparison with the material that preceded it such as the pleadings, the issue, the arguments, etc. At this time the judicial system was not designed primarily to elicit decisions, but to frame the points that were to be referred to a jury. Judges’ rulings concerned procedure and were spoken in court so they were not available for copying. By Plowden’s time things had changed. The profession wanted to know how and why a case ended as it did. It seems to me that this is the most important point made in Professor Baker’s talk. For it was the development of the idea of precedent both on the Continent and in England at this time, as Professor Ibbetson was to explain next, that led to the changes in the legal system that the profession’s need for a new kind of reporter. Finally there were two other new, important practice adopted by Powden. Unlike the Year Books, Plowden also consulted those who were involved in the case to ensure accuracy and he included the judgment, which the Year Books could not have done because they reported cases before judgment. The judgments were set in a different type so they wouldn’t be confused with the reports. Plowden set a high standard and there was never to be another volume quite like it. Most of what Plowden included is to be found in today’s reports. Indeed Plowden’s departures from the Year Books were the origin of our view of what a good report should include. What we now call the judgment includes the judge’s informal statement of the case, the facts of the case, the legal question, the arguments presented in court, references to the authorities, and the reasons for the conclusion. The second most important point that Professor Baker made, in my opinion, was that there was a continuous line of reporting that began with Plowden and continued through Dyer and Coke. This line formed the tradition that the future nominate reports continued. The work of the next reporter, Dyer, was published posthumously. Sir James Dyer began gathering his reports in the 1530s, before Plowden had begun. He left his manuscripts to his two nephews who were law students. The published edition was taken straight from Dyer’s notebooks. Although it included over a thousand entries, it left a lot out, e.g, cases that might embarrass a living person, cases that Plowden had already covered, and matters too sensitive to make public for reasons of state. Within twenty-five years of their publication, the notebooks were in the possession of Sir Edmund Coke who cited them often. It was common for judges to keep jottings in notebooks at this time as aids to memory. The exception to this was Edmund Coke whose work was published in eight volumes. He began taking notes in the 1570s and began making them available to others in the next decade. The earlier notebooks were essentially the story of Coke’s rise in the bar. Coke embellished and amplified on many of the cases. In 1616 he was charged with inaccurate reporting and assigned to correct them. Francis Bacon volunteered to help with the task. In the very next year Bacon was made Lord Chancellor and banned Coke from Westminster. He did, however, put forward a proposal to hire three lawyers to report on the cases at Westminster at a salary of £100 a year. Although there were never more than two reporters, Bacon had revived the old custom. He appointed lawyers to do the reporting because they did a better job than judges. Before the reports were published, the reporters checked with the judges. Bacon’s scheme continued Coke’s reports up to 1619 when there was a hiatus in reporting until 1621. 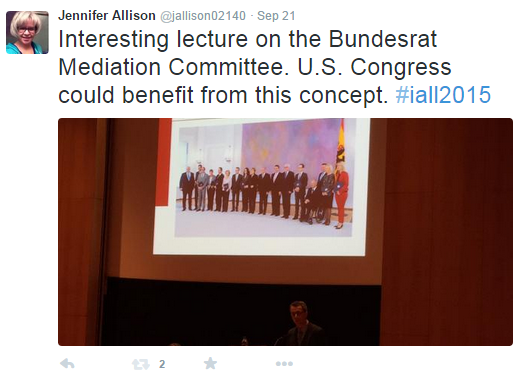 On Monday, September 21, the afternoon session of the 2015 IALL Annual Course focused on the Mediation Committee of the Bundestag and Bundesrat. First, we heard a lecture on this topic at the Staatsbibliothek zu Berlin by Claus Dieter Koggel. Mr. Koggel is an administrative officer (Ministerialrat in der Sekretariat) for the Bundesrat, one of the two houses of the German Parliament. 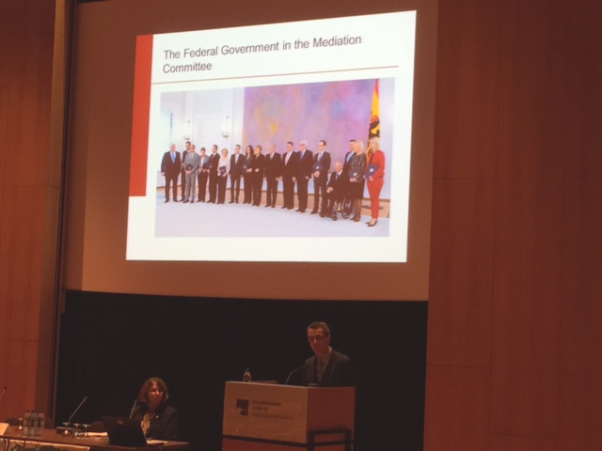 Mr. Koggel discussed the history and work of the Mediation Committee (Vermittlungsausschuss), which is a constitutionally-mandated body (established under Article 77 of the Basic Law) that provides a forum for resolving conflicts that arise during the legislative process between the Bundesrat and the other parliamentary house, the Bundestag. The Mediation Committee is comprised of 16 members of each house. Often these members are experienced parliamentarians with a wide range of knowledge and experience, and they are valued for their ability to think independently while also respecting the positions of their respective political parties. Under the German Parliament’s legislative process, bills are first considered in the Bundesrat, whose membership consists of members that represent each of the sixteen German states (Länder). After a bill has been passed in the Bundesrat, it is sent to the Bundestag, which then passes its own version and sends it back to the Bundesrat. At that point, if the Bundesrat refuses to pass the Bundestag’s version of the bill, the Mediation Committee is convened to attempt to work out the differences and produce a single, passable version of the bill that can be enacted into law. Mediation Committee meetings are strictly confidential: the only people allowed to be present during them are the members of the committee, two lawyers, and a stenographer. In addition, if a majority of the membership agrees to it, expert witnesses can be admitted to give testimony. Once Committee members agree to a compromised version of the bill, it is published immediately online and introduced to both houses for another vote. The frequency with which the Mediation Committee has been required to convene in it relatively recent history has varied, depending largely on whether the government was headed by the opposition party to that which held the majority in the Bundesrat . During one session particularly contentious session of Parliament in the past, the Committee was convened for 100 out of the 400 bills considered. That particular Committee enjoyed an 88% success rate, as only 12 bills of the 100 they considered failed to pass after the Committee’s deliberations. The current parliament only recently convened the Committee for the first time, despite being two years into its session, as they have made a greater attempt to compromise on their own before attempting mediation. 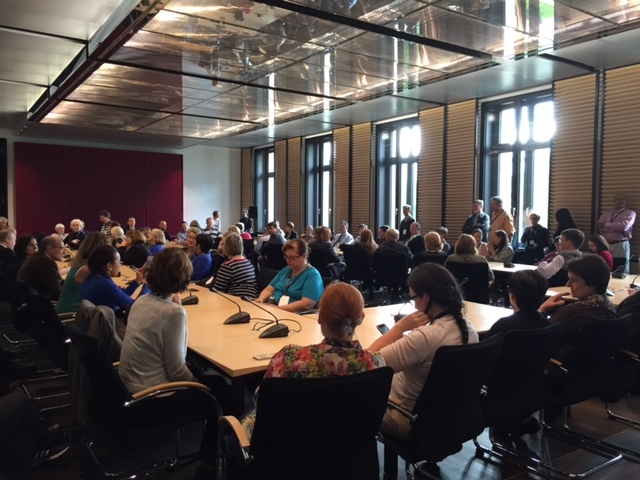 After Mr. Koggel’s lecture, IALL attendees visited the Bundesrat building in person. We were treated to a tour from a very informative and enthusiastic member of the Bundesrat’s administrative staff. 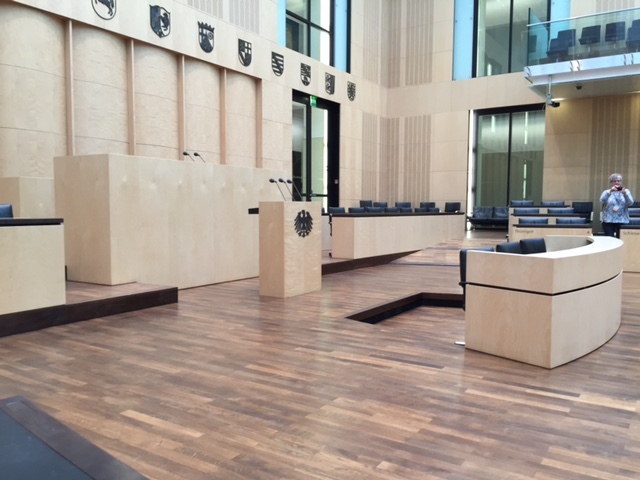 She showed us the plenary chamber, where the Bundesrat meetings take place, and discussed the finer points of the plenary procedure. Following this, we were taken to the Mediation Committee’s meeting room, where were once again met by Mr. Koggel. He took great care to point out certain interesting and useful features of the room, such as the power window shades, which were installed to prevent the prying eyes and long-range camera lenses of the media in adjoining buildings from eavesdropping on the compromises that were taking place during the secret Committee sessions. Perhaps both of these are true. But it is firmly established as a component of the legislative process, and in addition to its constitutional mandate, the Committee is also influenced by established best practices, parliamentary law, and the judicial decisions of the Federal Constitutional Court (Bundesverfassungsgericht). In the U.S., so many battles between Republicans and Democrats in Congress end up being played out in the media, and politicians often appear to be more motivated by scoring points with voters in upcoming elections than by achieving legislative success. It struck me during the program that maybe this Mediation Committee would be a valuable import for the U.S. Congress to consider, so much so that I ended up tweeting about it. However, I have to admit that I’m skeptical that an organization like this could ever be considered, let alone work, in our government. 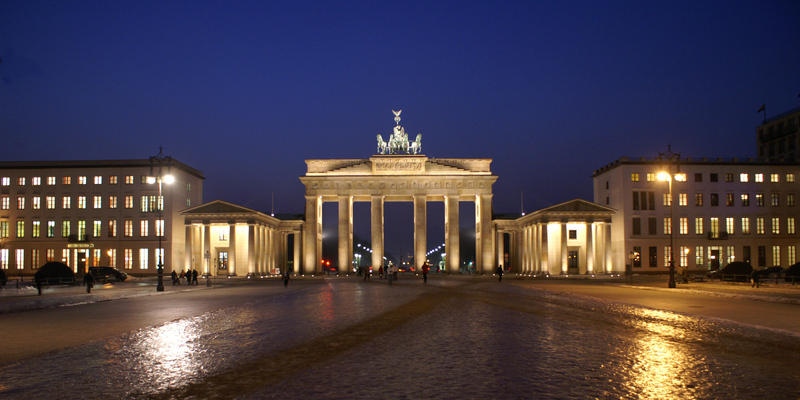 DipLawMatic Dialogues Is Heading to Berlin! The conference programming will “reflect Germany’s legal history and will characterize unique perspectives on international and domestic law issues as well as legal information items. Speakers at the sessions will include highly regarded German legal scholars, legal practitioners and law librarians.” More information is available on the conference website. If you are attending the conference and would like to contribute to our blog coverage, please contact Susan Gualtier at susan.gualtier@law.lsu.edu. DipLawMatic Dialogues looks forward to bringing you conference coverage and photos throughout the next week!